The horror attack unfolded just six days before tens of thousands of athletes and fundraisers will take to the streets of the capital. Sports Minister Hugh Robertson insisted he was 'absolutely confident' that the capital event could be kept safe. Following a review of security arrangements with the Metropolitan Police and other authorities, organisers later confirmed it is still on. 'We have reviewed and will continue to review our security arrangements with the Metropolitan Police and other authorities. 'We are being fully supported in all aspects of the event to safeguard our runners, spectators, volunteers and staff. 'Runner registration will take place as planned, with David Weir CBE opening EXPO at 11am on Wednesday 17th April, and we look forward to welcoming our runners there. 'The support we have been offered by our stakeholders and the wider running community has been outstanding. We have the full support of the Metropolitan Police, the Mayor's office and other authorities. 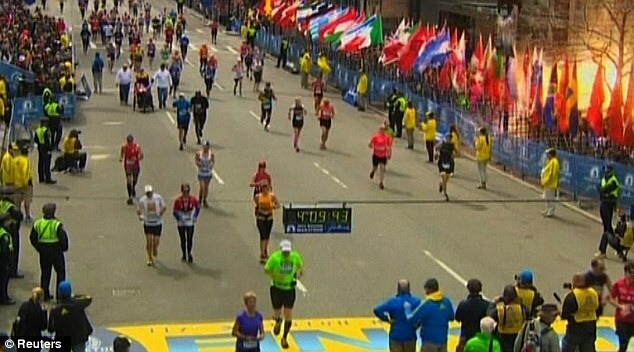 Boston Police confirmed at least three people lost their lives in two explosions which tore through the spectators' area near the finish line of the Boston Marathon yesterday, as reports emerged the youngest victim is believed to be just eight years old. 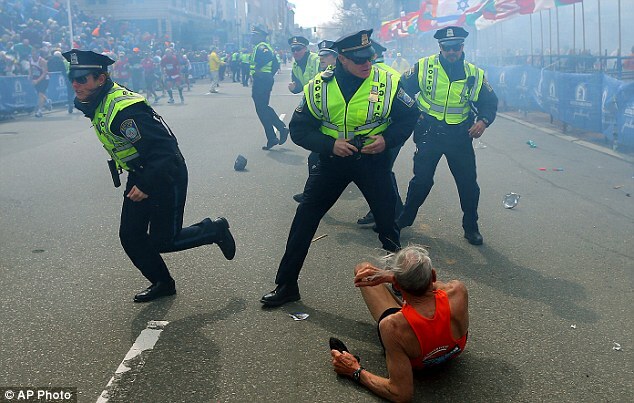 In terrifying scenes, the world's oldest and most prestigious marathon was thrown into chaos by the blasts as scores of the 25,000 'fun runners' streamed past. A number of people caught up in the blast remain in a critical condition. The injuries ranged from cuts and bruises to amputations. 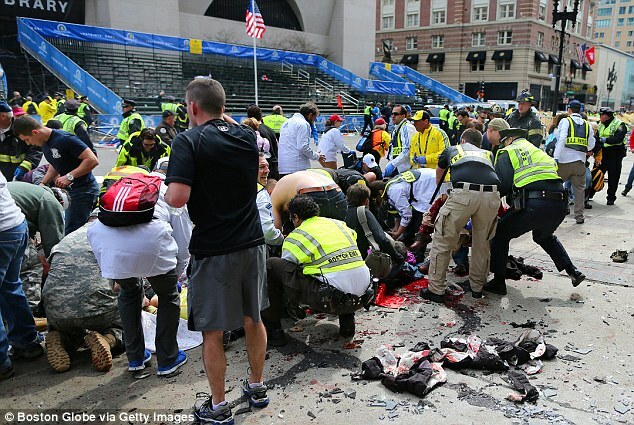 Many victims suffered lower leg injuries and shrapnel wounds. Some suffered ruptured eardrums. 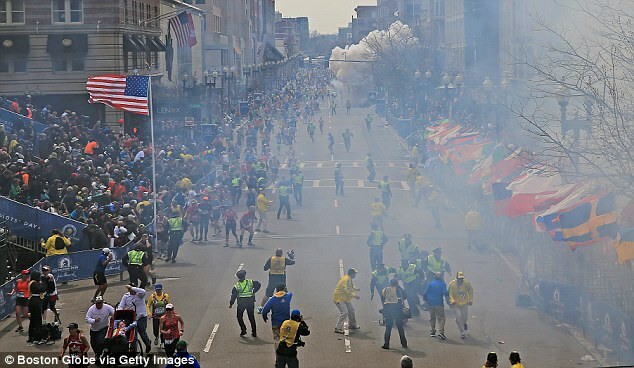 The twin blasts at the race took place almost simultaneously and about 100 metres apart, knocking runners and spectators off their feet, shattering windows and sending smoke rising over the street. The devices found were believed to contain ball bearings. 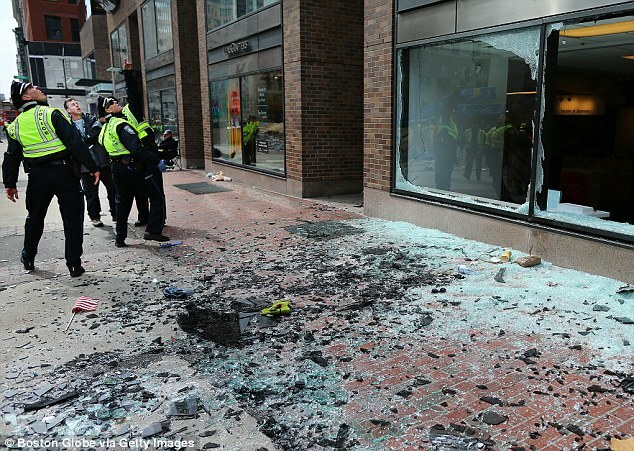 About two hours after the winners crossed the finish line in the heart of central Boston, there was a loud explosion on the north side of Boylston Street, just before the photo bridge that marks the line. Another explosion could be heard a few seconds later. 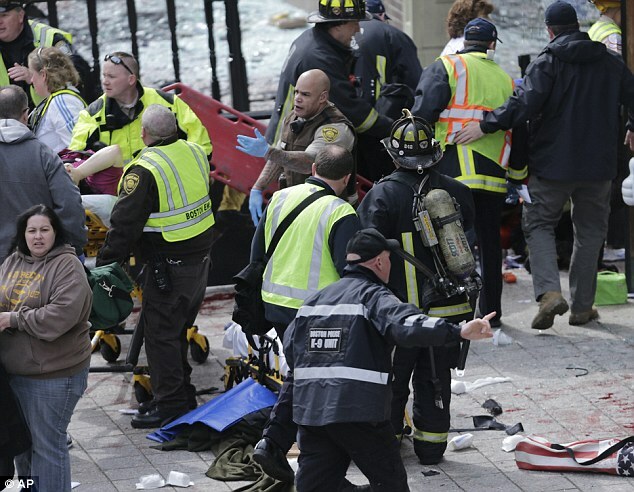 Governor of Massachusetts Deval Patrick has since warned residents in the city to be vigilant. 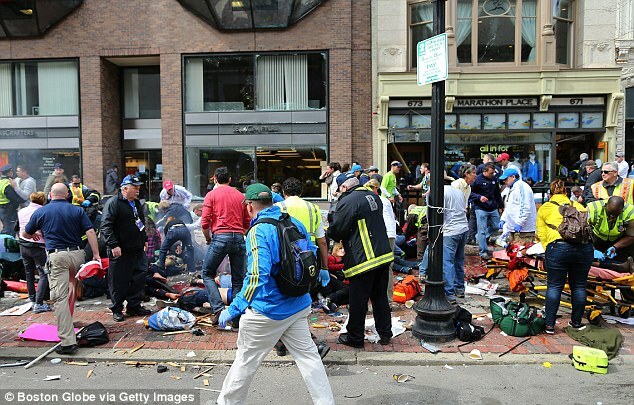 Governor Patrick said that although Boston would be 'open' it would not be 'business as usual' after the horrifying explosions and warned there will be a 'heightened security presence' in the city. He also said that people can expect random checks and should report any suspicious packages and suspicious activity to local police. The FBI said it was leading a 'potential terrorism investigation' by the city's joint terrorism taskforce into the twin explosions. But reports of a suspect being held at a city hospital were dismissed by Ed Davis, Boston's Police Commissioner, who told a press conference that no suspect had been arrested. In a televised address, US President Barack Obama said those responsible will 'feel the full weight of justice'. 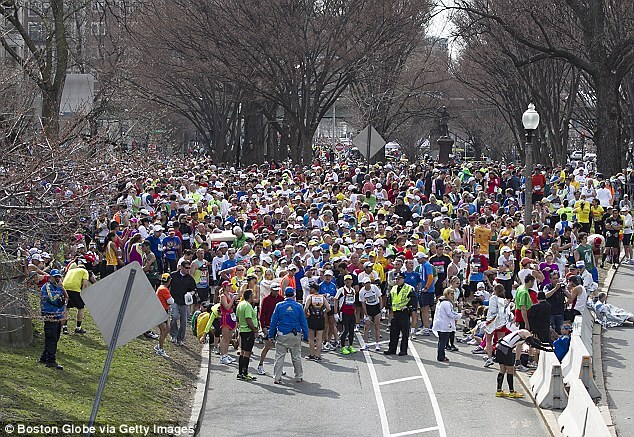 Speaking from the White House, he paid tribute to those who helped wounded runners and spectators, saying: 'The American people will say a prayer for Boston tonight, and Michelle and I send our deepest thoughts and prayers to the families of the victims in the wake of this senseless loss. Mr Obama added: 'We still do not know who did this, or why. And people shouldn't jump to conclusions before we have all the facts. 'But, make no mistake, we will get to the bottom of this, and we will find out who did this, we will find out why they did this. 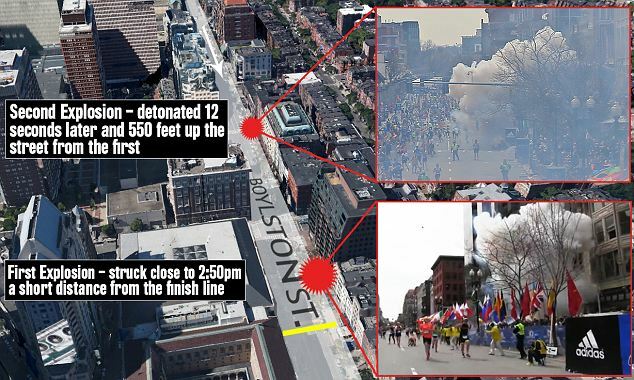 Commissioner Davis said there had been two 'simultaneous explosions' near the finish line of the 26.2 mile event around four hours into the race. He told a press conference in the early hours of this morning that 'at least three people' were dead but that exact figures on the number injured would be released later today. This cowardly act will not be taken within stride, we will turn every rock over to find the people responsible for this,' he said. Commissioner Davis earlier said there had also been a third explosion at the JFK Library in the city but he did not believe there were any casualties as a result of that blast. The explosion is not currently being linked with the two at the race. 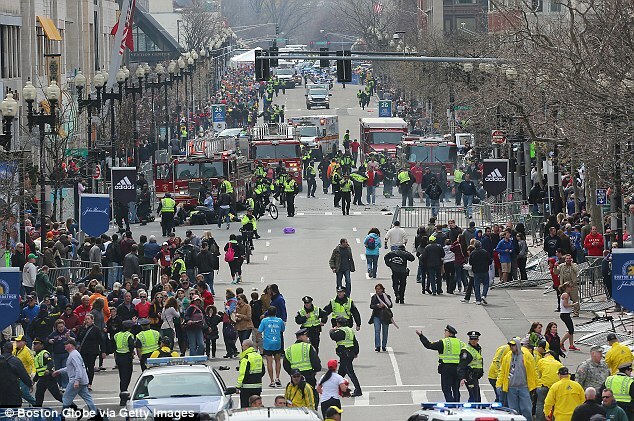 Bomb disposal teams carried out a controlled explosion on another suspected device, and Commissioner Davis said a number of unattended packages along the marathon route were being treated with caution.